Art Edwards - Laying Down the Law: Stuck Outside of Phoenix and Ghost Notes going out of Print!!! Stuck Outside of Phoenix and Ghost Notes going out of Print!!! I'm busy finishing Novel 4, which is called Nineteen Ways to Destroy Your Rock Band. The novel is in its final stages. I want to say it will be done in four months, but with a final read-through it's probably going to be more like six. It always takes longer than I want, but in the end if it's not top-notch, what's the point? Know that I'm working on it daily, and that it's coming. Also, I've recently decided to take both my first novel Stuck Outside of Phoenix and my second novel Ghost Notes out of print. The plan is to re-release the two novels as one book sometime in the future. I also have a short story called "The Move," featuring Hote as a 16-year-old, and I hope to include this story in the collection as well. That would be all the Hote I've ever written, and also everything I have to show for my first decade as a fiction writer. I think this would make a great collection, so I'm pulling everything from the market now to accrue some time between now and this projected re-release--which would fall sometime after the publication of Nineteen Ways. Again, don't hold your breath, but that's the plan. Stuck and Ghost Notes have already started to disappear from places like Amazon, and by 2018 they should be gone everywhere. I do still have them both for sale at my website for now, and at the ridiculously low price of $5 each, while supplies last, but I'll take them down from there eventually as well. Should you want or need a copy, now's a good time. 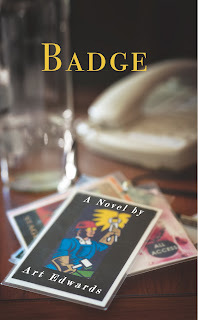 For the record, none of this affects my third novel Badge, which is and will continue to be available everywhere. I think that's it. Have a great holiday season, everyone, and as always, feel free to touch base.